The original version of this short fairy tale appeared on Tuigen’s Wall. Substantial changes have been made to the tale since then… the current version, which will become the first chapter of the published work, appears below. Chapter 1. A Crystal Tear. The first day of spring found Julia racing down the sidewalk on her bicycle, long dark-brown hair blowing in the cool breeze. Julia slowed as she neared the end of the sidewalk where the concrete changed to thick grass, yet to be mowed. With a laugh, she leapt from the saddle and pushed her bike up the little hill leading into the small forest preserve. Once summer comes it will dry out the path and I’ll be able to ride all the way to Annabelle’s house! But I can’t ride through just yet because Spring rains are keeping the path so damp my bike’s wheels sink right in. Besides, I love walking through the lonely peaceful wood. I miss our secluded little house in Athens. There, by walking less than fifty feet, I could disappear into the woods surrounding the house. A wistful smile lifted her lips, and her spirit. Athens was a wonderful place to live, but it was also very lonely. If I’d had my bike I could have ridden, but I was too young to have a bike of my own, which meant the only time I’d seen my friends was at school. Her smile widened into a happy grin. The woods in Athens were full of my imaginary friends. Nymphs, satyr’s, fairies, even a few goblins! The goblins were a bit scary at first, but they were okay once I got to know them. I guess they just like keeping to themselves, kind of like we all do at times. Besides, goblins prefer playing down in the valley where they can swim in the river. A pensive frown creased her brow. She sighed again. Julia’s smile returned as she reached into her pocket and took out her cell phone. But this phone is real! She squeezed the phone as though its plastic cover granted it a reality her imaginary friends had never truly had. Almost reluctantly, she slipped the cell phone back in her pocket. Tears crept into her eyes. Why can’t I remember any of their names! The nymphs were my friends, and I can’t even remember their names! What kind of friend am I if I forgot my friends after only a couple of years of city life? Tears threatening to overflow, Julia squeezed her lips together to try and stifle the sob she felt building. Her lips formed a resolute line as she shook her head briskly. Long brown hair flew through the air from the empathic motion. Her attempt to deny her growing unhappiness failed. Two perfect tears escaped, sailed through the air, and arced toward the earth. Their glinting path drew her sidelong glance, deep brown eyes following, expecting the tears to vanish into the grass. Those eyes widened in startled shock as two fairies zipped into sight. Each caught a teardrop in their outstretched hands before flapping their narrow wings in an impossible attempt to hold themselves aloft. Burdened beneath the weight of tears, both sagged toward the ground, wings flitting in frantic haste as they landed. Julia stopped abruptly, frozen in the instant her eyes recalled the trick and marked the places upon which the fairies perched. One upon a yellow flower, fresh unfurled. One upon a spring twig, still bare of leaf. She listened, ears sharp. Her heart fluttered in delight as the faint sounds of singing nymphs reached her. As expected, the instant she turned her head toward the fairies they vanished and the nymph song faded. Joy flooded her as she focused on the fairy perched upon the yellow flower. A mysterious glint of light! My own teardrop, magically suspended above the flower! Moving nothing but her eyes, she focused on the still leafless twig. 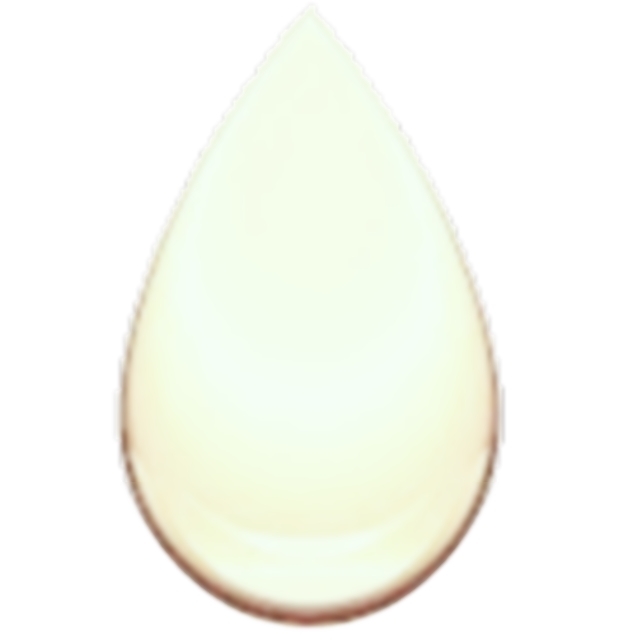 Another tear… another magical gleam of light, another mysterious droplet impossibly floating in the air. With both tears seen and their precise positions noted, she slowly knelt. Still barely breathing, her knees touched the grass. The narrow, iridescent wings of a glimmering green dragonfly flickered into view. A moment later, and its oversized eyes and elongated body appeared. A tiny voice sang out, as soothing as a thought fading into sleep. A moment of doubt came to Julia. It must be a dragonfly, what else can it be? Another shimmer of tricky light. Four translucent wings appeared, followed a moment later by two multi-faceted eyes. Hundreds of tiny rainbows reflected from them. A torso, long, thin and elegant, appeared last. Julia responded with her own soft-sung refrain, recalled from memories thought lost. The sound of tiny bells jingled as the air around each dragonfly shimmered into sprinkles of fairy dust. When the glimmering dust settled the dragonfly bodies had changed into two tiny figures. Each stood barely as tall as Julia’s smallest finger. In contrast the four transparent wings spread from their backs seemed enormous. Each wing was as long and slender as their entire body. The fairy who stood on the leafless twig wore a snug bodice over a flowing gown of gleaming gold. The one standing on the yellow flower wore a neat jerkin of brilliant green, with matching pants. Each clasped one of Julia’s tears in their cupped hands. Though the tears glistened, as tears do, they somehow still held the shape of teardrops. Two perfect teardrops, with their pointed tails facing upwards, as though frozen into crystal the instant the fairies had caught them. With a faint shimmer of dust, the gold-gowned fairy flitted up to the yellow flower. She landed elegantly alongside the green clad male. Although it seemed impossible, their oversized wings didn’t clash but pointed out behind them. Both stared up at Julia. The golden female shushed him. Tiny tears made her eyes gleam. She shook her head, then spoke in a voice husky with emotion, “No… we may once have been as real as her, but every passing season sees us diminished. Without tears to sustain us, we’d already be gone.” A tiny, sorrowful sigh, “Believing tears of joy are what we need, but instead we barely survive on the bitter tears of stolen sorrow.” Her tiny shoulders slumped with the weight of this terrible admission. The male glared up at Julia, angry eyes proclaiming her guilt for bringing the golden fairy to sorrow. His tiny lips pursed in anger before he shook his head, turned away from Julia toward the golden fairy, and murmured, “Here, take a taste of mine, my Dearest. It’s probably as bitter as bile, but it might pick you up.” With that said he lifted the crystal tear cupped in his hands to the golden fairy’s lips. Her sorrowful eyes peered out from beneath impossibly long lashes as she silently entreated Julia for permission. A tiny pink tongue flicked across ruby-red lips before the golden fairy leant forward to give the tear a gentle, tender kiss. Though Julia didn’t know what to expect, the explosion of fairy dust startled her. It caused her to jump as it sparkled and crackled its way slowly to earth. The green male came back into view first. Eyes wide, jaw slack in surprise, with gleaming golden dust covering him from toe to tip. The golden fairy said nothing. She just smiled and held out her tight clutched tear toward her beau. Now hesitant, where moments before he had seemed so sure, the beau looked up toward Julia. His tongue flicked around suddenly dry lips to moisten them. With an indrawn breath he closed his eyes, then touched puckered lips to the tear. Another brilliant explosion puffed, this time of green. Now the golden female stood covered in gleaming green dust. As the shimmering cloud crackled to earth, Julia saw the beau glowing green. Where the golden fairy might easily have been mistaken for an errant beam of sunlight, the magical nature of the green fairy was undeniable. Save for a sunlit emerald, nothing in nature shone so brilliant and green. soon to you we’ll show. With Julia spellbound, they flew backward in perfect unison, wings flittering as fast as any hummingbird. Eyes wide and mesmerized, Julia followed as they led her a few dozen paces off the path. When they paused, she laid her bicycle and backpack against a gnarled tree without any need of instruction. The buzzing tempo of fairy wings changed as they flew in a circle above Julia’s bicycle. Julia smiled vaguely as another cloud of fairy dust showered over her bicycle and pack. Unafraid, she watched her them glow, then completely vanish as the fairy dust settled on them. A moment later, Her hands and clothes shimmered and started glowing. Now the golden fairy balanced her crystal tear in one hand, reached beneath her gown with her free hand, and pulled out a tiny wand. An intricate wave, and its tip glowed brilliantly. Except for the blur of flittering wings, she hung motionless in the air, murmured strange words only partially heard, and drew a jagged arc through the air. A bolt of frozen blue lightning appeared, precisely where the wand waved. The blue line parted slowly, to reveal a glimmering crystal tear through the air. On the far side, sunlight reflected off a pond in a lush green glade. Without any hesitation, the fairies flew into the open lightning bolt. Completely calm, Julia waited for the tear to widen. 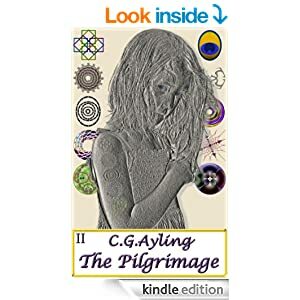 As soon as it seemed big enough for her to pass without touching its flickering edges, she ducked low and stepped through. A faint crackle, like crepe-paper crumpled, and the crystal tear closed behind Julia and the fairy pair. As suddenly as it had appeared, the jagged lightning vanished. Except for a faint scent of ozone hanging in the air, no trace it had ever been remained. If you’re interested in how writing changes over time then I encourage you to visit Tuigen’s Website and read the original version. If you’d like to learn where this tale leads, encourage me to continue developing it by posting a comment ~ Thank you, Charles. Perhaps you might be tempted to read my more serious work. 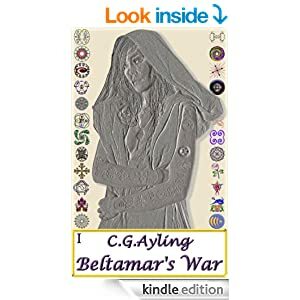 Here is the sample for Beltamar’s War, the first book of Malmaxa. It is available on Amazon Kindle, and in paperback form. This is wonderful, I adored the songs and all the beautiful imagery. I’d love to see it illustrated in a big collection of fairytales! Yes, please keep writing it! Crystal tear needs to be finished. We love some of its images. Will Julia return? Can she save the fairy kingdom from extinction? Charles….I finally read CRYSTAL TEAR. I enjoyed it and absolutely loved the images you conjure up so beautifully. Pingback: on Talent | Malmaxa. Another View, of True ©. Oh this is wonderful! I am going to share with my 9 year old granddaughter after school today. We love taking my dog Jane Austen to the woods to play and we make up all kinds of imaginary stories while there with fairies and witches. I will go onto Amazon to obtain Beltamar’s War now. Also, thank you so much for the follow. I start a 4 week intensive Lyrical Lab course today and hope to improve my writing for publication. With tenacity and drive it will happen. Look forward to following your posts. I love doing the same thing with my daughter Julia, who is now 17. If you look at the images on my Twitter timeline you’ll see a mushroom in which I very clearly see a Fairy standing guard over the forest. I’m in the process of updating into an illustrated children’s book, Julia will do the artwork herself :).